Farmer and Son's Knoxville Junk N Trash Removal is ready 24/7 to pick up your old bed mattress. Call us 24/7 for a Free quote! Call us because moving furniture is back breaking. We have great chiropractors taking care of us. Let us move your bed for you. We can haul your used mattress. If you catch us sleeping on it then its because we are working long hours and you called needing it done now. Some things are too big to fit in your trash container. Don't we all know you won’t always have the time or energy to get rid of your large, bulk waste items. We can help you get rid of mattress that may be to heavy for you. That’s our job. We can help to dispose of your bulk garbage, so you don’t have to worry about it. Call us for FREE quote!! 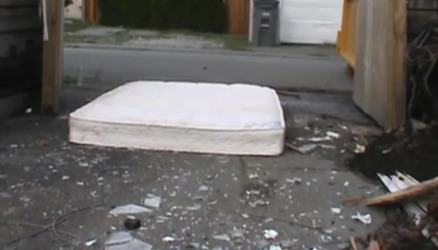 We will move even that nasty mattress with bedbugs!